A landscape full of shrubs and flowering plants may still look odd and unattractive. But adding concrete works like decorative concrete or stamped concrete in the design will definitely enhance the overall look of your landscape. Dramatic improvements in the landscape will not be achieved if a landscaper will only use common concrete designs. An experienced contractor knows that improvements in any landscape require a lot of creativity and application of various techniques to achieve the best results for concrete works. Design West Landscaping is just one of the few companies in California who have the best people knowledgeable on all types of concrete. If you are planning to enhance a part of your outdoor living area or you want to highlight the beauty of concrete elements in your landscape, contacting Design West Landscaping is your best option. We specialize in all types of concrete, whether it is decorative or stamped. The old big grey slab of cement used as a foundation for any flooring is now boring. Decorative or stamped concrete coatings will turn this cement slab into an exciting floor covering that will stand firmly on its own. Stamping is usually used to get the creative patterns and designs in freshly-poured cement mixes. Crafty stamping is widely used to create fake bricks, stone, slate or wood. You can even have a combination of tiles, aggregates, stones or rocks though such process. Stamped concrete are always great for pavers considering that they are also safer and easier to apply and maintain. They are good substitute for the traditional masonry and are tested to be durable and long-lasting. 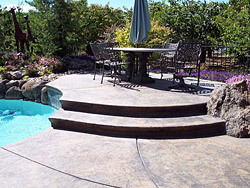 Decorative concrete coating can provide flexible designs. Through them, you can create stamped, stained, polished floors or any designs, which can turn out to be less expensive than those of the traditional floor coverings. Since concrete is durable and strong, it has excellent rigidity that can tolerate weight or any physical impacts. With the decorative concrete, the strong cement foundation will be something beautiful and strong. Durability and easy designing are great reasons why decorative and stamped concrete are good for your budget. Aside from these, the cleanup of the flooring systems will not be very complicated. The maintenance cost of decorative and stamped concrete is lower compared to other materials. Decorative concrete becomes significant in green construction projects. They support energy efficiency efforts since they can maintain comfortable inner temperatures in the buildings. The use of bricks and natural stones is also avoided. The web is stuffed with great companies that offer good landscape services but you need to make certain of your decisions. 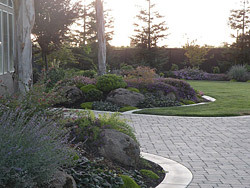 At Design West Landscaping, all types of concrete works and any other landscape project are handled by professionals. We have ample trainings and our years of experience as a landscape contractor in California gives us a great advantage over our competitors. If you are in the San Joaquin Valley and the East Bay Area, don't hesitate to call us on any concrete work involving decorative or stamped concrete.